Bossa Studios are arguably running the risk of becoming an “edu-tainment” company. Surgeon Simulator 2013 was of course a terribly serious and realistic tool for teaching surgery to the masses, and now their latest game Twelve a Dozen looks set to help gamers brush up on their mental arithmetic. Developed in conjunction with American educational organisation Amplify, they hope to present mathematics to young people in a more engaging way. A short cutscene introduces us to the game world, a land of numbers that exists within the dot on a calculator screen, where all numbers live. And within that world is Dozenopolis, home to our hero, Twelve. 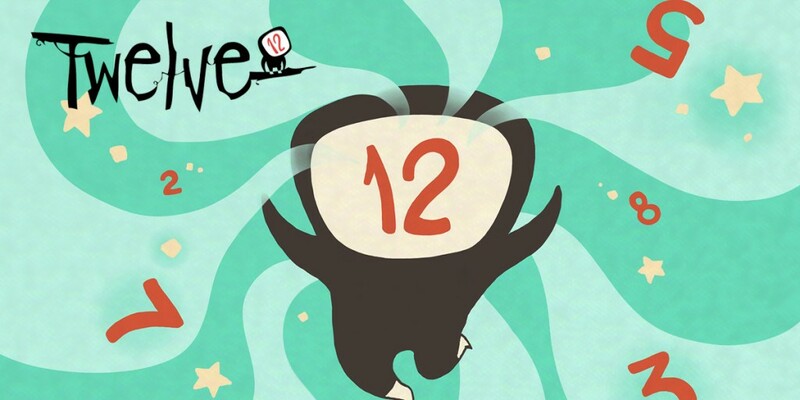 Twelve is a small creature whose face resembles a Television screen with a large number twelve in the centre. We join the protagonist as her world is seemingly collapsing around her, and her only guide to safety is a nameless glowing sprite who narrates and teaches you how to play the game as you go along. There is little story other than the fact that the world is falling apart – but this still provides ample impetus to push on through each level, and a basic need to find out what has caused this catastrophe. 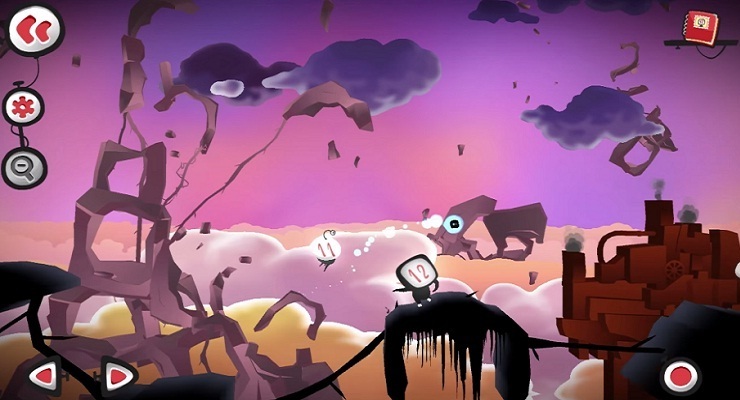 The gameplay is controlled with three simple buttons; forward, back and jump, and some intuitive touchscreen controls. Given that the title is concerned with mathematics, Twelve a Dozen combines traditional platforming action with number-based puzzles. A series of collectible items known as Numbles are scattered throughout each level, each with a number value of their own. These must be collected and combined at various gateways with categories like addition and subtraction, in order to change the face value of Twelve. For instance, you may see a switch ahead that can only be pushed by a 14. After collecting a 3 and a 1, Twelve can use an addition gate to add 3 to 12, and then a subtraction gate to minus 1 from 15. Only then can the button be pushed. 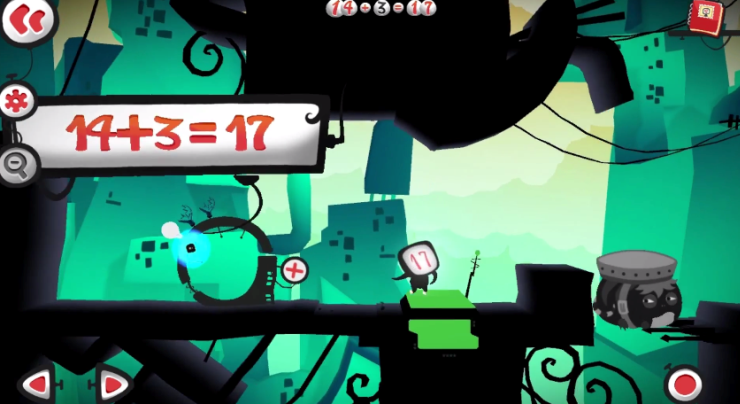 The sums get progressively tougher throughout the adventure, and once multiplication and division are introduced some very long equations must be conquered in order to proceed. Certain face values even have specific skills, such as 9s being able to jump high, 5s swimming and 4s pushing blocks. Managed to get your number value to 94? You can both jump high and push blocks. Some areas such as fragile bridges can only be crossed if your value is less than or equal to a certain number, so be careful not to cross of you are too high a value. This may sound complex, but the basics can be picked up within a few levels and the mental arithmetic begins to become quite natural. None of the mechanics feel forced and the implementation of simple swipes of the touchscreen feels very intuitive. By employing hints, generous checkpoints and a rewind system, Twelve a Dozen is never too punishing and it is always simple to get yourself out of trouble if you make a mistake. Of course, if you want better scores you will avoid using hints and rewinds, but that allows for some replay value as you go back over levels to improve your performance. There are only three levels in the game so far, each consisting of ten stages but, as with many iOS titles, a free expansion has already been promised. That’s a good thing, because there is no conclusion to the story in these levels and with the simple but engaging charm of the gameplay, the entertaining voice over work and the stark, bold graphics, there is much to appreciate in Twelve a Dozen. Don’t be put off by its claims of spreading maths to the masses – it never feels like a lecture. Any improvements to your number skills seem more like a happy coincidence, as Twelve a Dozen entertains more than it teaches. A charming little game that actually succeeds at making maths fun.